While I do a fair amount of hiking, mountains like Mt. Rainier are really at the upper end of the types of hikes that interest me. Given that it is snow-capped and covered with glaciers and I have only climbed one such mountain before (Mt. Hood in 2016), the most logical approach to climbing this mountain was to hire guides. For anyone interested in hiring guides, there are three main companies that guide on the mountain: RMI, IMG, and Alpine Ascents. Since I used Alpine Ascents on my previous climb like this and had a good experience, I decided to use Alpine Ascents again. I think that was the right call as will be made clear in this trip report. I’ll note one other thing for others considering climbing Mt. Rainier with guides. Most of these companies list their hikes almost a year in advance and the hikes sell out quickly. 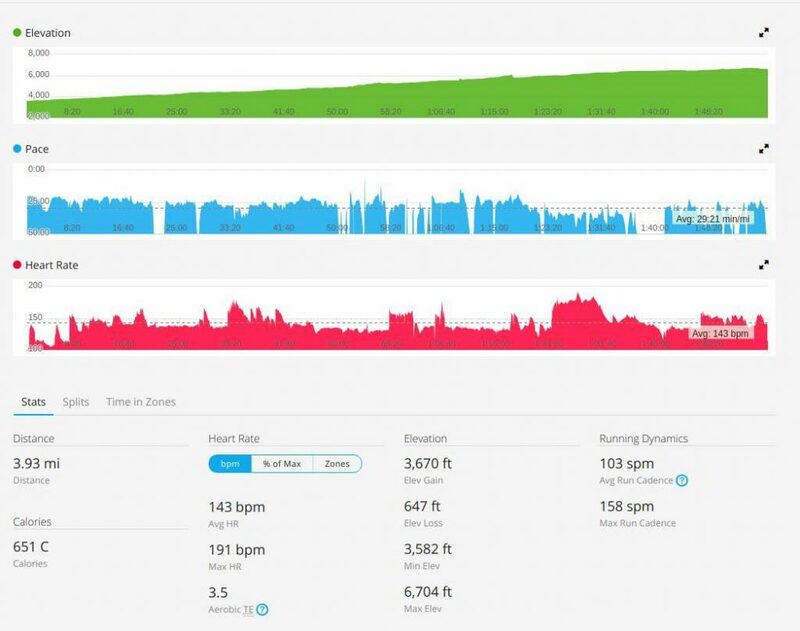 If you’re interested in climbing Mt. 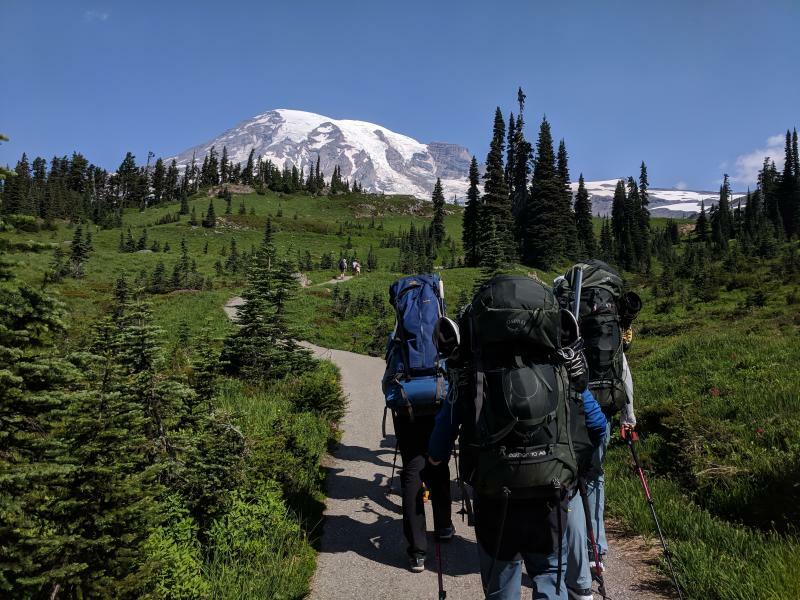 Rainier, I’d strongly encourage you to sign up for the newsletter for the company you want to go with almost two years before you plan to hike Mt. Rainier. You’ll then get a notification when the hikes are listed on their website so you can book your hike. If you wait until even 6 months before the hike date, it’s likely the hikes will all be sold out. My trip began with a flight to Seattle on July 28th. With flight delays and such, I ended up arriving the same time as my hiking buddy, Tom. We then hopped on the train from the airport into Seattle and finally caught a bus to get us to our hotel, the Marqueen Hotel, which is just a block or so from the headquarters of Alpine Ascents. Our hotel room wasn’t ready so we grabbed a bite to eat then headed to the Alpine Ascents office with all our gear. We had a gear check at 2:00 pm. The gear check involved going through all the equipment we brought based on their gear list and then renting any remaining equipment we needed. Given the technical aspects of the climb, crampons, harnesses, ice axes, helmets, and avalanche beacons were all required gear (along with standard cold weather clothing and such). The gear check included some instructional videos about climbing on Mt. Rainier. By the time we had our packs largely ready, the gear check took us at least 2 hours. 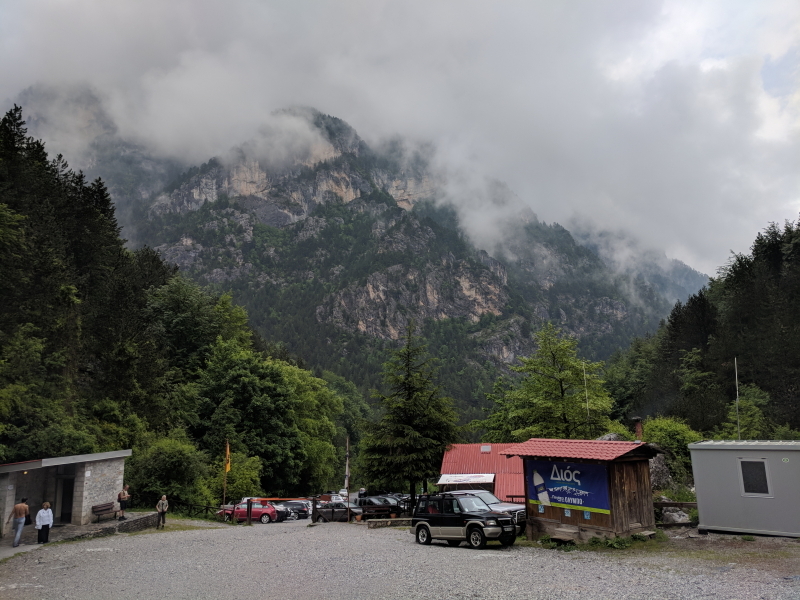 We still needed to pick up some food for the next few days – mostly snacks, but also some more substantial food as Alpine Ascents provided breakfasts and dinners but not lunches on the mountain. (As one of the guides said at one point, “There are no lunches on the mountain, just constant snacking between breakfast and dinner.”) We found a nearby grocery store, stocked up, then headed back to the Marqueen Hotel where we had dinner and finished getting everything ready. We met back at the Alpine Ascents office the next day at 4:45 am. We left our suitcases with anything we didn’t need to take on the hike at the office, put our packs into a trailer, then hopped on a van. We had 8 clients to begin with, two of whom drove themselves from Seattle to the trailhead. The rest of us rode in the van. We stopped at a bakery on the way to grab breakfast. 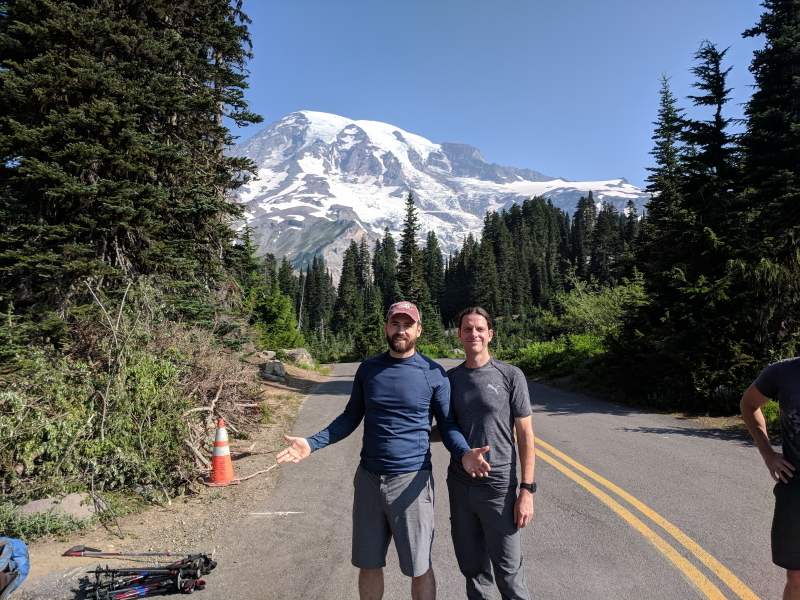 Then, just outside of the Mount Rainier National Park we stopped to pick up our three main guides – Robin, Matt, and Travis. (Our fourth guide, Towner, was already on the mountain at Camp Muir.) For this climb, Alpine Ascents likes a 2 to 1 ratio of clients to guides. The Paradise parking area was where our hike began and our car ride ended. Here, our guides took over (previously, other staff from Alpine Ascents had been providing us with instructions). They went over our plan for the day. We then geared up, splitting up the food from Alpine Ascents among our packs. We had one issue with a backpack (a missing buckle) that the guides were able to solve with a buckle hack. Otherwise, we seemed to be ready to go. Ryan and Tom before the hike started at Paradise. I will note at this point that I had some issues with the big backpack. I do a lot of hiking, but most of my hiking is day hikes with, at most, a 20 to 30-pound pack (if I’m with others, I usually carry their water as that amount of weight doesn’t affect me). The big backpack I have is a 65+10 liter pack. It’s a bit on the small end for hikes like this. I also have a sleeping bag that is a bit older and therefore a bit bigger than most and didn’t have a compression bag for it. Finally, I probably over-packed slightly on gear and food. All told, I’m guessing my pack weighed closer to 50 to 60 pounds. I had not trained with a pack that heavy and it was a bit of an issue for me. The hike started on the paved trails at Paradise and followed those trails up until the paving disappeared. Once we reached the Muir snowfield, we stopped and switched from our hiking boots or shoes into our mountaineering boots with a hard shell (that we’d be using with crampons) since we’d be hiking the rest of the way to Camp Muir in snow. The views of the glaciers at this point were pretty cool. We could see this waterfall from the Muir Snowfield. 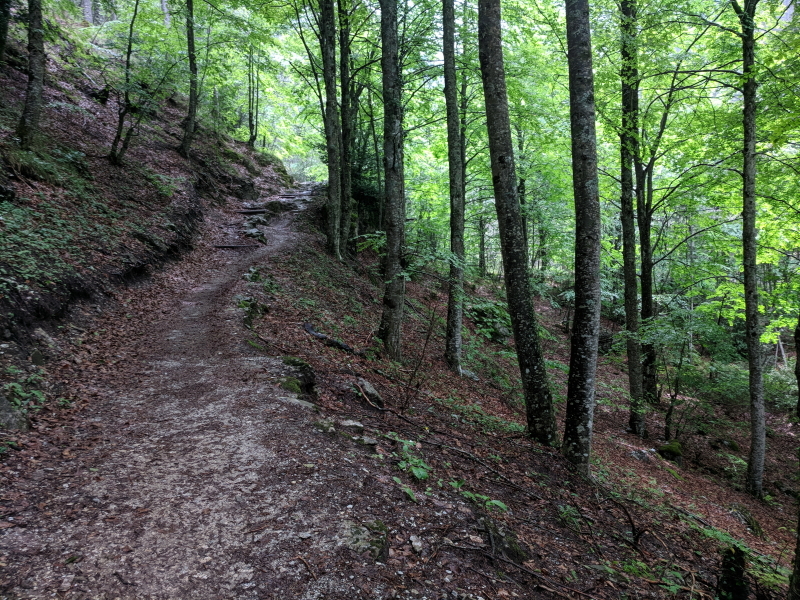 Returning to my pack issue… I was doing fine on the paved and dirt trails with the heavier pack. It was a bit uncomfortable, but not a serious issue. However, once we switched to hiking on snow, the weight really started to get to me. We hiked for several hours up the snowfield, which, once you are on it, really doesn’t seem like it is ever going to end. We started hiking around 10:30, covered just under 5 miles (4.79 per my watch), and it took about 5 hours and 15 minutes. With my heavy pack and the trudging in soft snow, I struggled. Don’t get me wrong. I’m a pretty strong hiker and I was one of the first to make it to Camp Muir right behind the guides. But, when I arrived, I was exhausted and, mentally, was wondering whether I was going to be able to complete this hike. Without the very heavy pack, I would have been fine. But those extra 20 or so pounds really got to me. We stayed in a wooden hut with shelves for bunks the first night at Camp Muir. My buddy, Tom, really can’t sit still. He somehow managed to get connected with the forest service people and was helping them install some new solar cells and wiring in a building they were working on by the time we were supposed to go to dinner. We had really amazing burritos for dinner. At dinner, our guides went over the plan for the next day and rounded out the evening with advice on getting as much sleep as we could and trying not to wake up our fellow climbers by going to the bathroom in the middle of the night. After dinner, we all headed back to the hut and went to bed. Given the challenging hike that day, I slept pretty well. Alpine Ascents’ approach to climbing Mt. Rainier (in this 3-day package) is different from RMI’s approach (but the same as IMG’s, with whom they share the hut and some other equipment). On day two, after a hearty breakfast, we spent the morning in snow school, learning how to walk in crampons, how to walk roped together, how to use ice axes, and how to do self-arrests on glaciers. Tom and I had done all of this before on Hood but it was a good refresher course. Before snow school, we made sure we had all the stuff we were taking up to our high camp on the Ingraham Flats. If we wanted to leave some stuff at Camp Muir, we could. I had already pulled out the food for the entire group, which dropped my pack weight by 6 to 10 pounds. I also left my hiking shoes and my inflatable pad at Camp Muir in order to cut some more weight from my backpack (about another 5 to 8 pounds). With that weight gone, my backpack was probably closer to 40 pounds and was a much more comfortable weight for me. After a quick lunch, we geared up and hiked the about one mile to the upper camp at Ingraham Flats. It didn’t take very long – close to an hour. However, it did involve crossing some areas with fairly active rockfall, which was when most of us realized that this hike was pretty serious. This was also a chance to get a sense – both by Tom and me but also the guides – who the stronger hikers on a rope line were. It turns out, there were several strong hikers in our group, but perhaps the strongest (even stronger than Tom and I), was a Microsoft employee from France, Olivier. He was less experienced than Tom and I but, physically, he was moving well and seemed quite comfortable on the mountain. We didn’t know how many people we’d have on a rope team the next day when we attempted to summit the mountain but we wanted to make sure we’d have a solid team and Olivier seemed like he’d be a strong team member. We were also dealing with another issue. 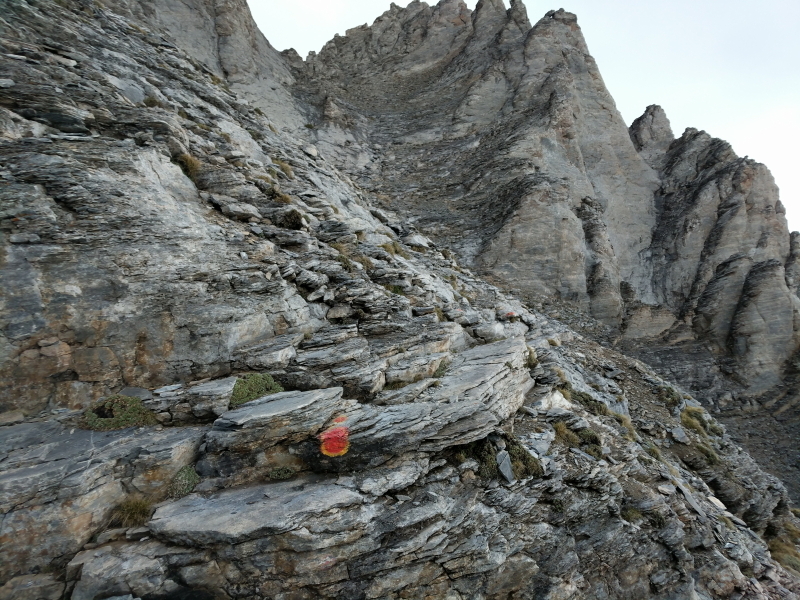 The previous two teams from Alpine Ascents had made it to Ingraham Flats but had not summitted Mt. Rainier because the route that had been established was too dangerous. Basically, a massive ice fall had collapsed onto the trail up above the Disappointment Cleaver and more ice was hanging over the trail. Teams from RMI had pushed right over the fallen ice, which really wasn’t being held up by anything and could collapse at any time. They were also walking under the ice that was hanging over the trail as well. For Alpine Ascents, that level of risk was unacceptable as it basically put clients and guides into a very dangerous area not for a minute or two (like the rockfall we crossed this day) but for about 20 to 40 minutes. That was too dangerous. Our guides were constantly talking with other guides about the trail. We didn’t overhear all the conversations but could tell that our odds of making it to the summit were pretty low. In fact, after dinner on the first night, I asked our head guide, Travis, what our odds were of going up to the summit. He didn’t answer at first, but when I gave him some numbers, he finally nodded at around 10% to 20%. 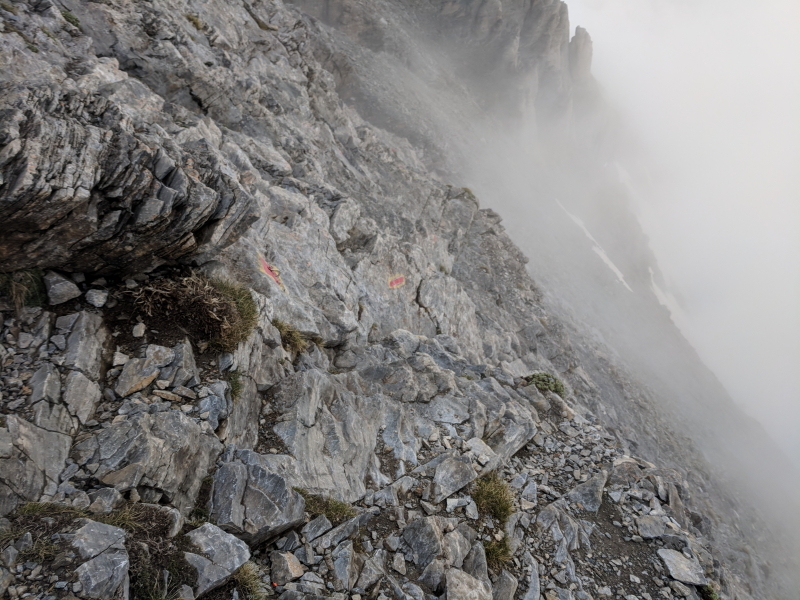 That was a bit of a downer for most of our team, but we were still going to get to go up to Ingraham Flats and potentially to the top of Disappointment Cleaver (which is a rock outcropping you climb on the way up). Our guides split up in the morning. 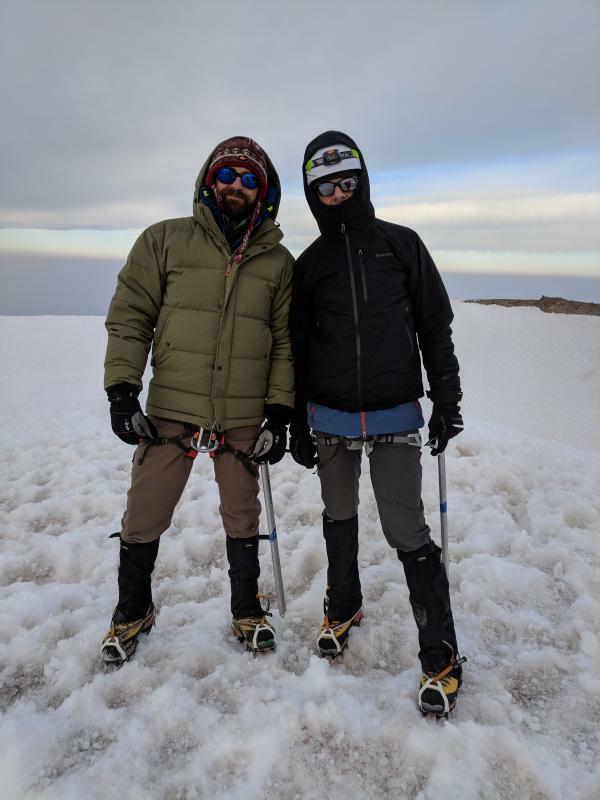 Two – Robin and Towner – stayed with us for snow school training while the other two – Matt and Travis – headed up the mountain to see how dangerous the current trail was for themselves and to see if there was a way around the dangerous ice fall. After we arrived at Ingraham Flats, we had a couple of hours to just kind of hang out. I had a book on my phone and a backup charger for my phone, so I sat and relaxed, reading and resting. Some of the other clients tried to get some sleep. I also took this photosphere of the camp, which shows just how amazing the views were there. Around 6:00 or so, Robin and Towner called us to the mess tent for dinner. We enjoyed some turkey burgers (again, we ate pretty well on the mountain) and talked. We could actually hear Matt and Travis coming down Disappointment Cleaver but couldn’t see them. We finished dinner and were all wondering whether we were going to go up the mountain the next day. About 20 minutes after we finished dinner, Matt and Travis returned to camp and we headed out of the mess tent to hear the news. They actually did a very good job of leading us on. Travis started at the beginning of their adventure that day, explaining that they found the dangerous section of the trail and it really was an accident waiting to happen. He wouldn’t want to cross it himself let alone with clients. He and Matt then tried to find a route around that section. They had several false starts, found an okay route, then ran into an almost vertical wall that they were able to cut some steps into, had to walk along the edge of several crevasses, and did a lot of searching, but… By the end, they had carved out a trail that bypassed the ice fall and would allow us to go the summit. It took Travis a good five minutes to get to the part we all wanted to hear – we had a safe route up the mountain. We all cheered – at least, as much cheering as you can do when you’re standing on a glacier and it’s really cold outside. Our guides gave us the last advice of the night. Try to sleep and don’t set an alarm. They would wake us up when they thought it was the right time to start up the mountain – somewhere between 11:00 pm and 1:00 am. The idea is to make it up in the dark while the ice is solid so you reduce the risk of ice melting and falling. We all headed to our tents and tried to sleep – most of us to little avail. I know I managed to get in a few hours because the time passed pretty quickly. Our guides ended up waking us up around 1:00 am. We had a quick breakfast of hot drinks and oatmeal. We also found out at breakfast that one member of our group, Ford, had decided he didn’t want to continue. He was feeling okay but was realizing that this kind of hiking was really not for him. He opted, instead, to stay at Ingraham Flats and wait for us to return. One of the guides, Towner, would stay with him. That left us with three teams – Tom and I with Matt, Olivier and Drew with Travis, and Leli and Thomas with Robin. Leli also noted that she wasn’t feeling all that well and suggested that she may not be able to make it all the way but she was going to try. After our quick breakfast, we geared up and headed out around 1:45. We made decent time crossing the Ingraham Flats to Disappointment Cleaver then worked our way up the Cleaver. Our first break was at the top of the Cleaver at the spot where our guides had forged a new trail. We stopped there and Leli indicated that she was going to keep going but was feeling worse. After that first break, we were off the trail all the other hikers were on, forging a new trail. Luckily, Matt and Travis have great mountain sense and had a clear sense of the trail they had blazed the day before. We could tell that there wasn’t much of a trail, so we tried to help make one as we went and Matt dropped flags to help guide us on the way back. Once we reached the very steep section that involved connecting ourselves with a carabiner to a fixed line, Leli indicated she had enough and didn’t think she could make it back down that section. Her team turned around while the rest of us continued. Part of the new section with steep drops on either side. 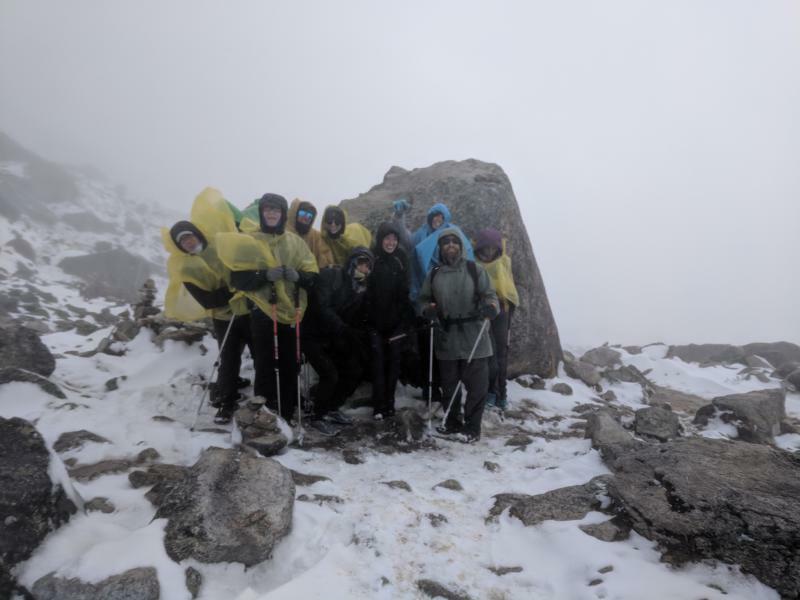 The two teams continued through the new section, then reconnected with the standard route and took one more break fairly high on the mountain. After that last break, the guides said we were going to push from there to the crater. Not knowing how far that was, we all agreed. Just below the crater was a particularly steep section. I was just behind our guide, Matt, on my rope team, with Tom behind me. Our guides had said that we had to be able to push at a certain speed and, if we couldn’t, then they were likely to turn us around as we had to be off the mountain at a certain point. With my much lighter pack, I was able to move pretty fast. However, that last really steep section was brutal. There were three or four times on that section that I was struggling to catch my breath and it was all I could do to put one foot in front of the other to keep up with Matt. Turns out, I wasn’t the only one who was struggling to keep the pace – Tom said he did as well. But, I wasn’t going to say anything about a quick break because we were so close to the summit and I didn’t want our guides to turn us around. Here’s a video panorama of the summit. 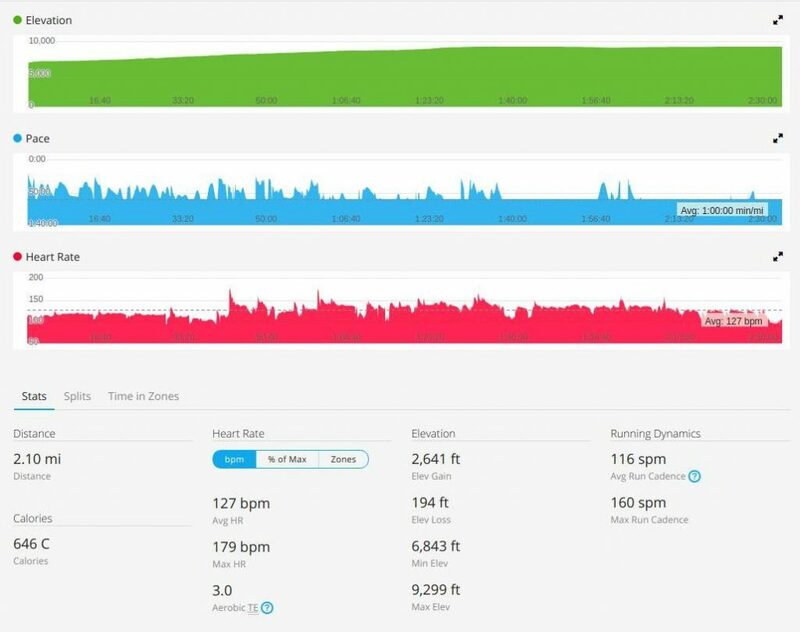 I felt like I was moving a little slower gearing back up, but once we got back on our ropes and started walking, I was able to keep up. About 20 minutes from the summit, my symptoms cleared and I was fine again. We pushed a good pace down from the summit until we reached the new section of trail. On the new section, our guides asked us to help “kick in” the new trail so the next group from Alpine Ascents would know where to go. We spent a good 45 minutes along the new section with the guides shoveling and the clients kicking in steps and trails with our crampons and cutting what we could with our ice axes. At the camp, the other two guides had been busy. They had dug out a new location for the mess tent as they have to move it every few weeks. It is on a glacier which is moving down the mountain, which opens a new crevasse regularly. So, they have to move the tent or it will go into the “REI crevasse” with all the other gear people have lost in there. However, we used the new tent location for something else first. Leli and Thomas were engaged and had hoped to get married on the summit. Since they had turned around, they opted, instead, to get married at our high camp. Honestly, the high camp marriage with Mt. Rainier in the background was a better location. The top of the mountain was kind of flat and, because of wildfires, didn’t have a great view. Plus, it was super windy and you couldn’t hear well. At our high camp, there was no wind. Travis, the lead guide, had gotten registered as a Universal Life Church minister just for this. He performed a really sweet, mountain themed wedding ceremony for Leli and Thomas with the rest of us looking on as the guests. I even got to be the ring-bearer. The wedding was a great way to cap off our time on the mountain. Tom sliding down the last section of the Muir Snowfield. From there, we stopped at a restaurant just outside of the National Park for a late lunch/early dinner with our crew and the guides. It was nice to celebrate with all of them what we had done. After our meal, Alpine Ascents took us back to Seattle to their headquarters where we returned our rental equipment and said our goodbyes. Tom and I had another hotel lined up for that evening. We checked into the hotel, took much-needed showers, and did our best to clean up before collapsing into our beds for a deep (but short) sleep before our early flights home the next morning. I’ll end with some brief thoughts on the hike. This was a tough hike. Without those extra 20 to 30 pounds in my backpack, I think I would have been fine on this hike. But hauling a 60 pound pack up the Muir Snowfield did come close to breaking me and I’ll admit that. Better packing and training with a heavier pack would have helped with this. I spent about an hour in the tent the second night meditating and using positive psychology and affirmations to convince myself that I could climb Mt. Rainier with the lighter pack. This is also a pretty technical climb with some really dangerous parts of the mountain. If the route was laid out and not at all dangerous, this would be doable with crampons, axes, and helmets. But, not knowing the condition of the route, the best way to do this hike is with good, reliable, and cautious guides, like those of Alpine Ascents. RMI was willing to take too many risks. I like climbing mountains, but see no reason to take such extreme risks. What’s the point of climbing these mountains if you don’t live to tell about the adventure? This is definitely a hike that requires the right gear and solid preparation. It’s a beautiful, invigorating hike, but not for everyone. For my work, a colleague and I decided to propose a new travel study course that would involve a combination of our interests – sociology of sport (hiking, specifically) and exercise science. Our original course proposal wasn’t approved, but our International Programs Office agreed to fund us to scout out a trek in Peru to improve our application and fill in details for the second time we propose the course. As a result, a colleague (Abe) and I spent a week in Peru in August of 2018. We spent a few days in Cuzco acclimating before heading out on the (Super) Salkantay Trek which covers about 34 miles (64 kilometers) in 3 days, ending in Aguas Calientes. The following day we took a bus to Macchu Picchu. This post is a brief summary of the trek. We flew from Tampa to Miami on a Saturday afternoon and then from Miami to Lima that evening, arriving around 9:30. In retrospect, we should have spent the night in Lima and then caught a flight to Cuzco the next day after getting a good night’s sleep. Instead, we spent about 5 hours in the Lima airport (me trying to sleep; Abe pacing the airport) until our 3:50 am flight to Cuzco. The travel agency that arranged our trip included an airport transfer to our hotel which, unfortunately, wasn’t ready when we arrived at around 5:30 am. So, we kind of slept on couches in their lobby until our room was ready around 8:30. By that time, daylight was upon us so we went out exploring in Cuzco. We spent a couple of days in Cuzco exploring the city and the cuisine while acclimating to the elevation (Cuzco is at just over 11,000 feet). 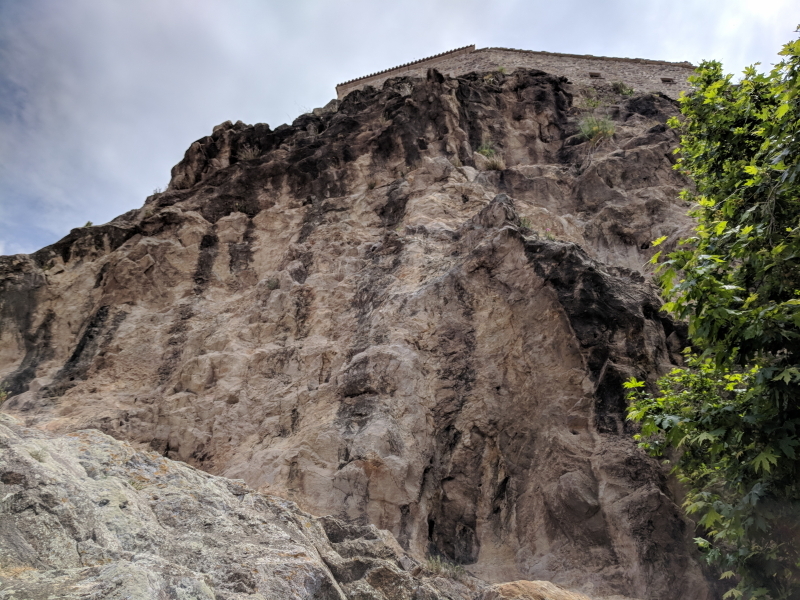 We visited some museums, tried a few restaurants, and even did a trial hike up to the Temple of the Moon, Q’Engo Chico, el Cristo Blanco, and Saqsaywaman. Despite having spent a day in Cuzco, we could still feel the elevation as we hiked and knew it would take a little while to acclimate to this elevation. In the afternoon on our second day in Cuzco, we met up with the rest of our group for the (Super) Salkantay Hike at the headquarters of G Adventures and met our guide, Ever. There were 16 of us total: 3 from the US, 1 from Canada, 2 from Switzerland, 2 from Denmark, 2 from South Africa, 2 from Wales, and 4 from England. We had a briefing session, had a chance to rent any gear we needed, and then were given duffels that would carry our sleeping bags and pads and any extra gear as we would only have to carry day packs during the day. Porters (using donkeys) would carry the duffels, tents, and food from campsite to campsite. Having just completed a serious climb of Mt. Rainier in Washington, this seemed like a walk in the park – let someone else carry all the heavy stuff and I just have to get myself from point A to point B every day. Elevation aside, I wasn’t expecting a particularly challenging hike. On August 6th, we got up around 5:00 am, had a quick bite to eat at our hotel, then hopped aboard a bus that drove us out to the beginning of our hike (stopping for a more substantial breakfast on the way). We started hiking around 10:30. It quickly became apparent that we had different levels of hikers in our group, with several quickly falling behind. I tried to stay at the front as I didn’t want to get caught behind a slow hiker. Our guide, Ever, set a pretty good pace. About 30 minutes in, we started to have light rain and everyone donned their rain gear (for many, this was just light ponchos; luckily, I have complete rain gear for hiking – top and bottom). As we continued, we started to gain some elevation. The rain also started to get a little harder. As we got higher up in elevation, the rain started to transition into sleet. Eventually, it became snow. Basically, we were caught in a snowstorm on our way to Salkantay Pass, which is over 15,000 feet in elevation. We continued our ascent and the snow got thicker. We stopped about an hour from the pass for lunch. The porters had set up a tent on about 6 inches of snow for us to dine in and had already prepared hot water so we could have tea and hot chocolate. They also made us a hot meal (soup and chicken tenders with rice). It was still freezing cold in the tent but we were largely out of the wind. I was generally warm with all my layers on (except for my hands in my light gloves), but there were many in our group who were much less prepared (one guy was in shorts the whole time). Additionally, one member of our group was slow enough that they had her ride a horse part of the way up the mountain. After lunch, we continued up the mountain, eventually making it to the pass where most of us huddled behind a large rock to get out of the wind as best we could while we waited for the rest of our group to make it to the top. Our huddle reminded us of a bunch of penguins trying to avoid the cold. A bunch of people in our group huddled together for warmth. We stayed on the summit until everyone had made it to the highest point of our hike then began our descent down the other side. It didn’t take long before the wind died down. Then we descended below the snow line and were hiking in mud and light rain. We hiked until just after 6:00 pm when the first wave of us made it to the camp for the night just as it got dark enough to warrant headlamps. It was very cold and raining at the camp but the camp had some buildings with tin roofs (where we ate and the porters slept) and our tents were already set up. The stragglers took another 30 to 45 minutes to arrive in the dark with flashlights. 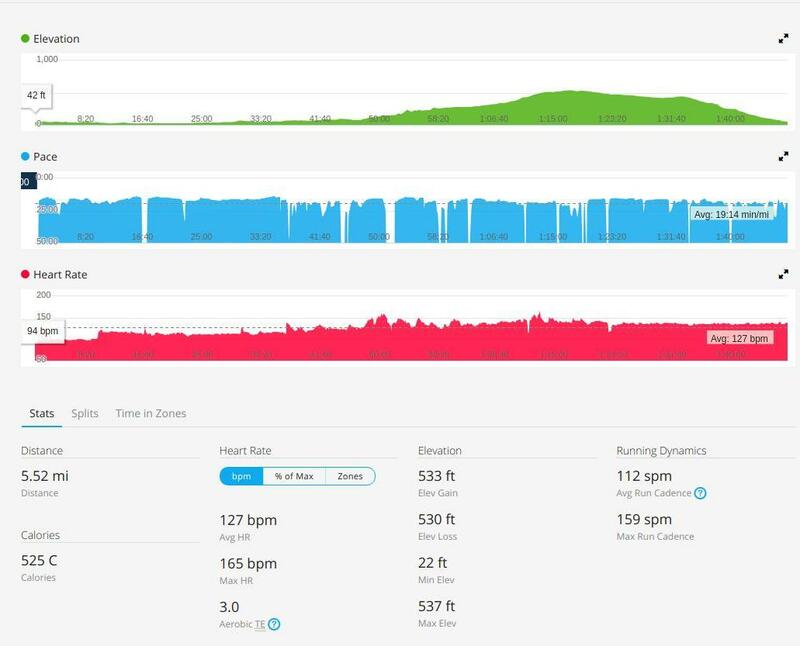 Per my watch, we covered 8.84 miles. Our starting elevation was about 12,562 feet; our peak elevation was 15,175 feet (highest I’ve ever hiked). The total elevation gained during the hike was 3,006 feet. We had about 45 minutes to get our sleeping bags and pads set up before dinner. At dinner, we once again had warm drinks (which were a delight) and ate well. The guide also laid out the plan for the next day, which was the longest hiking day. We went to bed around 9:00 but the hot drinks worked a number on our bladders. Abe got up to pee four times. I had to get up once, around 10:00 pm, to pee. Given the urgency, I didn’t put my pants back on and was caught in someone else’s headlamp in my underwear taking a piss. When you got to pee, you got to pee! Since we arrived when it was nearly dark, we really couldn’t see the amazing mountains that surrounded our campsite. In the morning, we had a few breaks in the clouds and realized just how amazing the location was. Alas, we only saw it for about 30 minutes before we headed down. We had a lot of hiking ahead of us – all day. However, it was also all down hill. As we descended, we crossed from a high altitude mountain region into a wooded area and eventually into the rainforest. It was actually quite interesting as our guide said that we would know when we were in the jungle when we saw bamboo and palm trees, both of which I have in my backyard in Tampa, Florida – I guess I live in the jungle. We did 6.58 miles before lunch, descending about 4,000 feet. We stopped for lunch for a bit over an hour. I made the poor decision to take my socks off to air out my feet to try to prevent blisters only to get bit about a dozen times by black flies in the 5 minutes I had my socks off. Terrible idea. My feet itched nonstop for the next three days! Our campsite this night was basically at the far end of a town, La Playa Sahuayaco, and even had a small bar near our campsite (where we could get beer and pisco sours, which we, of course, got). There was also a hot shower here. We had another 45 minutes to set up our sleeping bags in the pre-arranged tents before dinner. After dinner, our guide explained that our porters would be headed back over the mountain the next day to prepare for the next group of hikers and from here on our gear would be transported by vehicle. He also explained what our hike would be like the next day – a steep climb up a mountain until we overlooked Macchu Picchu followed by a steep descent then a bit of a march to the train station where we’d catch a train to Aguas Calientes and spend the night in a hotel. It was a short distance after this that we made it to Mirador Llactapata, which is an Incan ruin as well as a lookout spot over Macchu Picchu. We stayed here for a bit then began our descent down the mountain. It was close to two hours of a steep descent. At the bottom, we crossed another rope bridge then walked for a bit to a train station where we had a late lunch then boarded our train to Aguas Calientes. After three days, we got to take a shower and sleep in comfortable beds. It was nice getting back to civilization. Total mileage for the day: 8.59 miles. Our total mileage from the hike: 34.54 miles spread over three days. Traveling all the way to Greece for a week-long colloquium for work without taking any time to do some touristy stuff seemed like a waste of a flight across the Atlantic to me. When I thought of what I’d like to do if I had a few extra days in Greece I, of course, thought about visiting some ancient Greek ruins or various museums. But then I thought about hiking. I then had the thought, why not climb Mount Olympus? 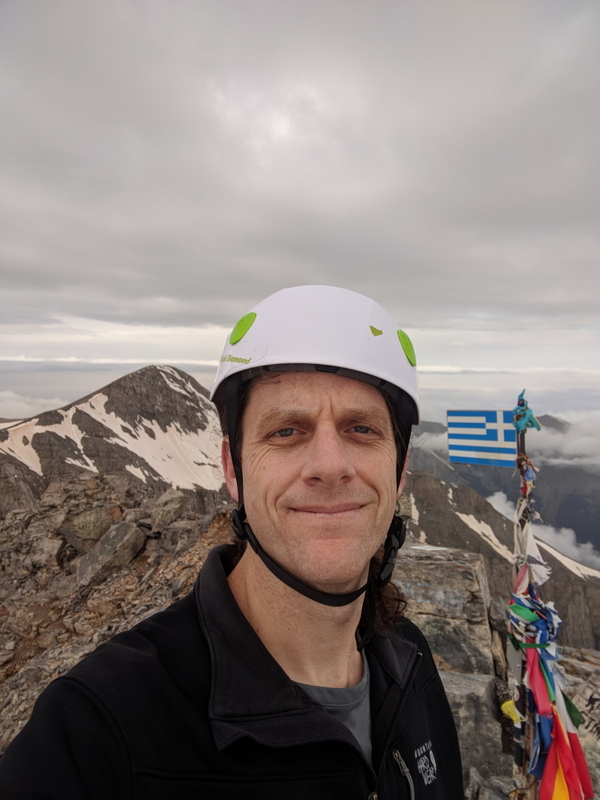 When the thought initially occurred to me, I wasn’t sure what such a hike would entail nor whether Mount Olympus was the highest peak in Greece. It turns out it is the highest peak and is a hike within my abilities. 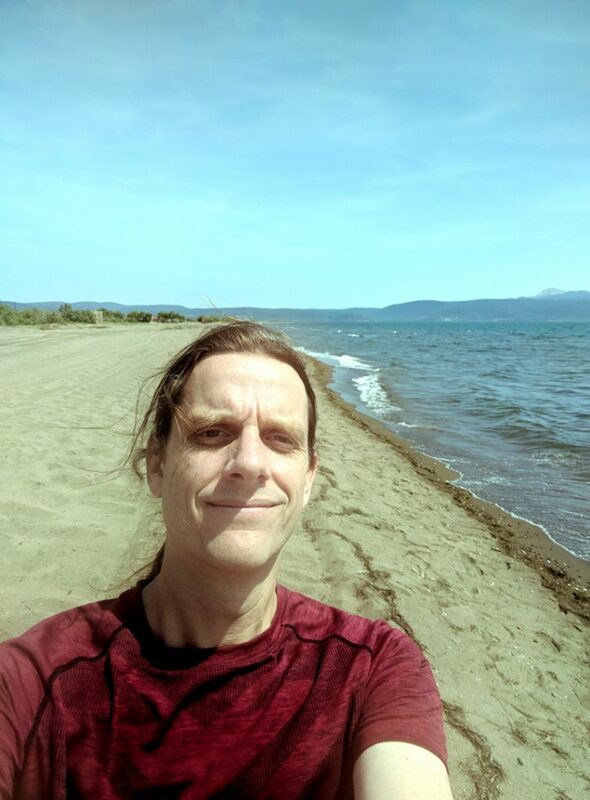 After spending a week on the Island of Lesvos for work, I caught a flight back to Athens, picked up a rental car, and headed toward Mount Olympus. I found some information online about climbing Mount Olympus, but not a lot (see here). The information I found online was sufficient to tell me roughly what to expect and where to start. But I didn’t find distances or GPS routes online (though there are maps available). What I found was that the standard trailhead is Prionia, which is basically just a restaurant at the end of a road out of Litochoro. A view of the restaurant in Prionia from the trailhead showing the rugged mountains in the background. Another thing I found online was that there are a number of lodges or refuges on the mountain where you can spend the night. 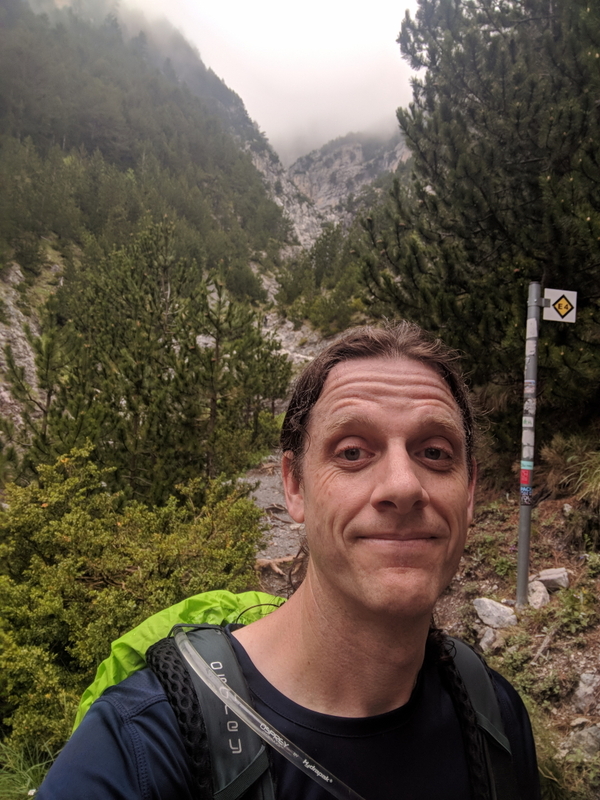 If you’re planning on climbing Mount Olympus in a day (which would be a pretty serious hike, see below), you may not need to reserve a night in one of the lodges, but given my itinerary, I needed to do so. I arrived in Athens early in the morning (around 8:00 am), made it to the Prionia trailhead around 2:45 pm, and knew I wasn’t going to summit that day. So, I booked a bed in Refuge A for that first night (and possibly a second, since I didn’t have a good sense of how long the hike would take). Most of the refuges have websites (Refuge A and the others). Just as I arrived at the trailhead it started to rain. I stayed in the car for about 30 minutes getting my pack and gear together. And since I don’t climb big mountains without bringing raingear, I also donned my raingear and put the rain cover on my backpack. However, just as I got out of the car, the rain stopped. I kept my rain pants on for about 20 minutes but then took those off as well. It was humid but actually quite beautiful just after the rain. Me at the trailhead just after the rain stopped. 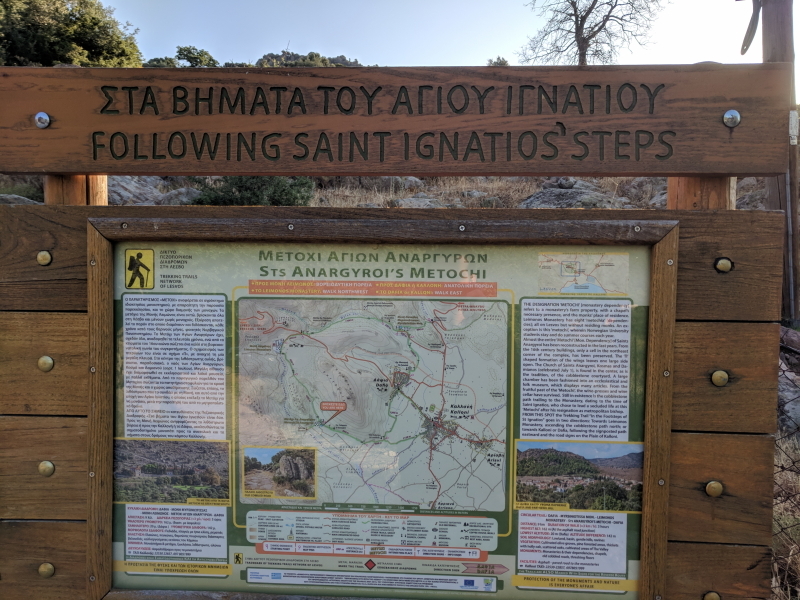 As noted, I wasn’t sure of the distances but had seen that the hike from Prionia to Refuge A (Spilios Agapitos) took one person 4 hours. Since the refuge doesn’t allow people to register after 8:00 pm, I knew I needed to get there fairly quickly. As a result, I pushed my pace a little bit and didn’t stop for many photos along the way. I also turned on the hike tracking app on my watch so I’d have a better sense of what the mileage actually is. This is part of the very pretty forested area on the lower portion of the hike. Me in front of an E4 trail marker and a particularly rugged portion of the lower trail. About two-thirds of the way to Refuge A it started to rain again, lightly. I ended up putting my rain jacket back on for the last third of the hike. I arrived at Refuge A around 5:00 pm. Never having stayed in a lodge like this in Europe, I wasn’t quite sure about the protocol. But the owners were nice and helped me get checked in and settled. It was €13 for a bed for the night. They also had lots of food, snacks, and other supplies. 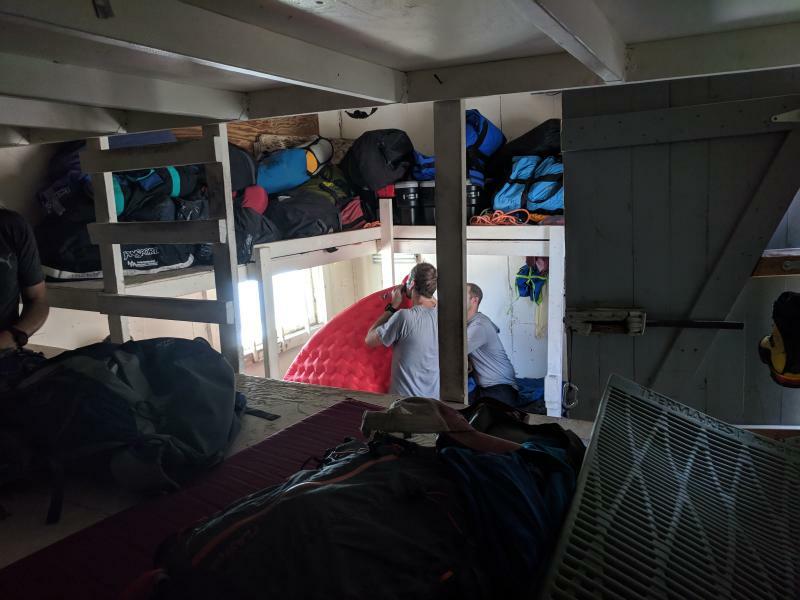 The refuge has a bunch of beds in various rooms (I was in the biggest which had about 20 beds in it), two dining halls, places to store gear, and restrooms. The water is ice cold and the toilets are holes in the ground. 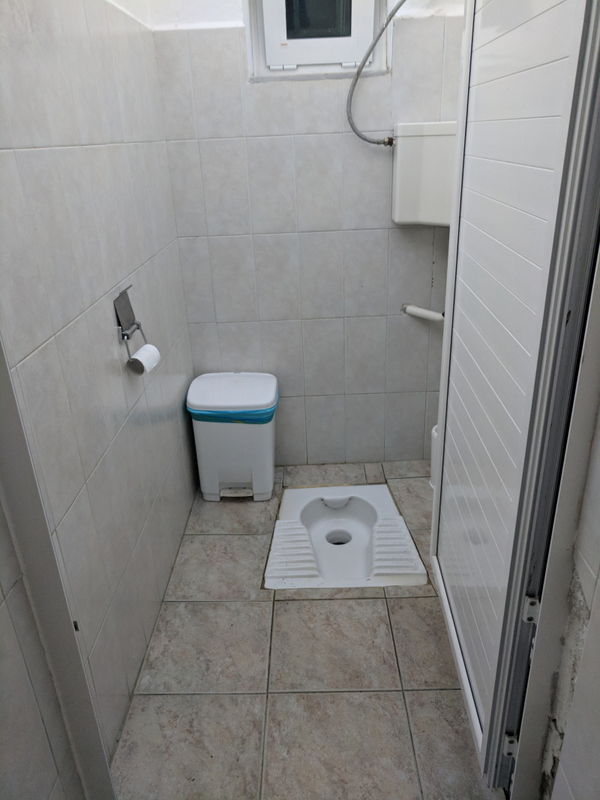 The toilets at Refuge A are like those in Japan – a hole in the ground. You squat over them. Once I got to the refuge and got settled in, I realized I had quite a bit of time (lights out at 10:00 pm). I had planned for this and brought a book on my phone to read. I ordered a drink and hung out in one of the dining rooms reading. Around 7:30 I ordered dinner (the portions are huge, so I ordered about half of the regular size). They technically have wi-fi in the refuge but it wasn’t working. They also have outlets so you can charge devices if need be. I was able to get a cellular signal in one spot outside by a tree (everyone seemed to know where the one spot was) so I could let my wife know I was fine. Otherwise, I just hung out and read until it was time for bed. Two other guys were headed out about the same time I was. They actually beat me to the trail while I was stretching, but I quickly caught up to them and they let me pass. From what I could tell, the people hiking to the summit from the lodge were generally pretty skilled hikers. 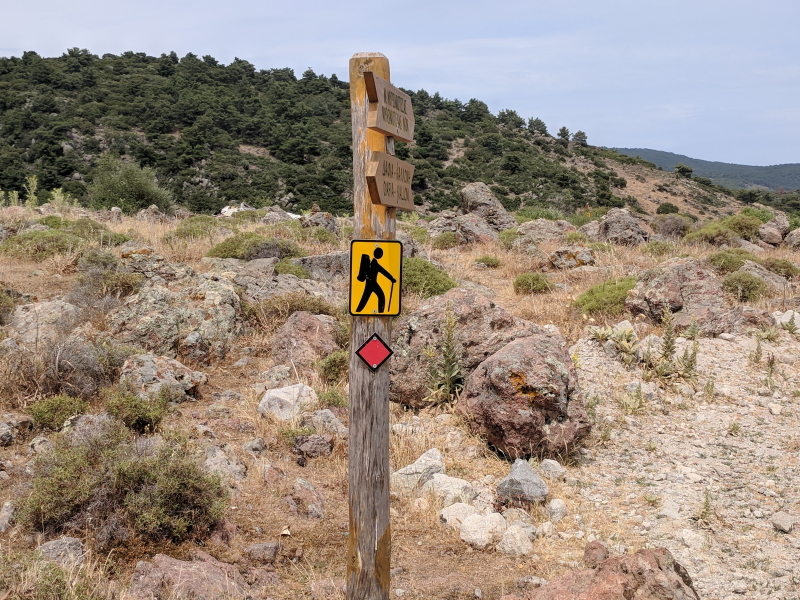 The two guys I passed did a good job of keeping up with me over the next mile or so as I ascended toward Skala (the third highest peak in Greece and the launching point to Mytikas, the highpoint). I didn’t see them much after that point. I made it to the summit of Skala around 8:45. 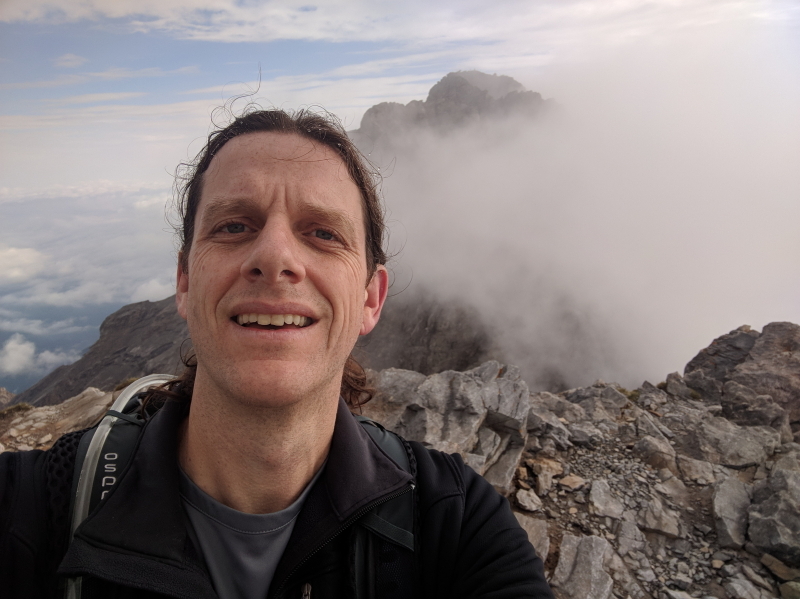 I had been hiking in fog for much of the time, but just below the summit of Skala, the fog broke and I had generally clear skies but clouds below me. On the summit of Skala I got my first real glimpse of Mytikas. This is the view of Mytikas from Skala. The fog was rolling out just as I got to the summit of Skala. 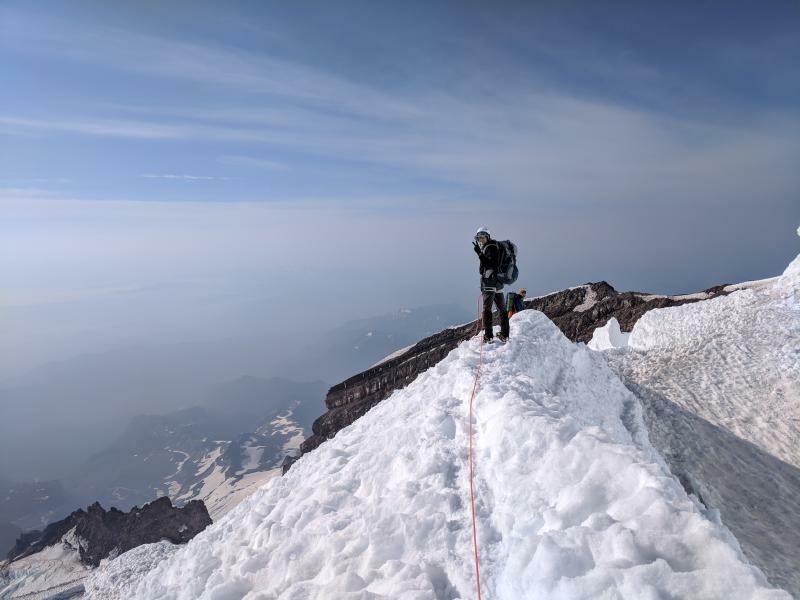 Not knowing how long the clear skies would last, I quickly swapped out my helmet for my hiking poles, slipped on my gloves, and started following the red blazes over the Class III section of the hike. The red (and often yellow outlined) blazes are pretty close together, which is good when there is fog. I had read that this section is a rock scramble that is somewhat technical. That is an accurate description. There are several spots where you are, in fact, climbing or descending near vertically. However, most of this section is not particularly dangerous and primarily requires slow, careful stepping, with about 1/3 of the time using both hands and feet. Follow the red blazes carefully and you’ll be fine. There are anchors in several spots for ropes but they are never really required. My sense, however, is that this section of the climb would be an ideal location to practice using ropes and harnesses for those who are new to technical climbing. It took me about 30 minutes to get from the summit of Skala to the summit of Mytikas. There is one spot that is a false summit about 2/3 of the way there. Don’t make the mistake I did and get up your hopes until you see the flag waving on the top of the summit. This photo shows one of the blazes with the false summit in the background. I arrived around 9:15. There were clouds below me but no clouds around me, offering me pretty clear views of Skala and the surrounding area. I had a quick snack then shot some photos and videos. Me on the summit of Mytikas. My tracking device indicated that it was about 2 miles (2.1) from Refuge A to the summit of Mytikas. It took me about 2 and a half hours to traverse that distance. I didn’t stay long before I headed back to Skala. As I did, fog started to roll back in. I ran into the first group of people attempting to make the summit behind me about 2/3 of the way back to Skala. It was a group of four and two solo hikers all working together (all were from the UK I believe; I’m fairly certain I was the only person from the US in the refuge the night before). One woman had gone only about 100 meters from the summit of Skala before she turned back. The steepness of the area freaked her out and, knowing her limits, she didn’t want to go any further. I mention that only to illustrate that this hike really isn’t for everyone. It’s steep and somewhat technical. Don’t be overconfident as it is a serious hike. By the time I got back to the summit of Skala, the fog had rolled back in and I could no longer see Mytikas. I swapped out my helmet and hiking poles and headed back down the trail. I made pretty good time going down. I stopped once to put on my rain jacket as it started to sprinkle below the summits. I also stopped at Refuge A for a snack and to air out my boots for a couple of minutes. I had told the owners of Refuge A that I might stay a second night depending on the time it took to climb Mytikas and the weather. But, given that everything had gone well, I opted to hike out that day and go do some other stuff in Greece. I tried to target arriving at the Prionia trailhead at 1:00 pm but missed it by about 10 minutes. This photo shows the mountain is steep and you are regularly shrouded in fog or mist. Presumably, you can drink the water. I didn’t. But I think it is supposed to be clean. I restarted my tracking device on the summit of Mytikas to get a sense of exactly how far it is from Prionia to the summit. Basically, it’s about 6 miles from the trailhead in Prionia to the summit of Mytikas. It took me 3 1/2 hours to descend from the summit to the trailhead. This was a more rugged, demanding hike than I originally thought it was going to be. I figured the trail would be pretty even and well-worn. The trail is generally pretty clear (not always) but it is quite rugged. The elevation gain is pretty substantial (over 6,000 feet total). And the technical section at the end to reach Mytikas is serious. Even though it doesn’t require ropes, it’s not an easy section, especially if there is fog or it is raining (I probably wouldn’t do it in the rain). This is not a pleasant day hike for someone without experience. This is a grueling, 12-mile round trip hike for experienced hikers. You should budget plenty of time for bad weather and the possibility that you’ll have to turn around and try to summit a different day. I did leave Mount Olympus with a greater appreciation for why the ancient Greeks would have believed that is where the gods lived. During the two days I was in the vicinity of Mount Olympus, I never once saw the mountains without clouds covering them. The idea that the gods live on a mountain shrouded in clouds makes a lot more sense to me. Mount Olympus is nearly constantly shrouded in clouds. I also can’t imagine ancient Greeks trying to climb Mount Olympus. I’m sure they were rugged and tough, but if they only had sandals or primitive boots and not a lot of experiencing climbing at those altitudes, it seems unlikely they would have ever climbed to the top. I think I understand why mountains were so mysterious and mystical now – they were impenetrable fortresses literally shrouded from view. Today, of course, we can penetrate those shrouds but that would have been virtually impossible 2,600 years ago. Thanks to my work on nonreligion and atheism, I was invited to participate in a week-long colloquium (May 13th through May 20th) in Greece by LeRon Shults in which I would serve as a “subject matter expert” helping LeRon and his team develop computer models to better predict who joins atheist organizations. You can learn more about LeRon and the project here. There were about 16 people who attended in total, with about half of them being subject matter experts like myself. We spent about 6 hours each day developing the models and thinking very carefully about the many factors that contribute to changes in atheist identity and affiliation. We would typically spend about 4 hours working on the project in the morning, have lunch, then take a break in the afternoon to either relax or go explore (the same time many of the people on Lesvos where taking a nap). Since I prefer exploring over relaxing, I typically used the afternoon break to go hiking or do something else active. Here’s a rundown of what I did while I was there. LeRon arranged to have a local bike shop owner come out and rent us bikes. There are a couple of towns that are pretty close, including Kalloni, Dafia, and Skala Kallonis. One of Skala’s claims to fame is that it was a temporary home of Aristotle where he studied biology. 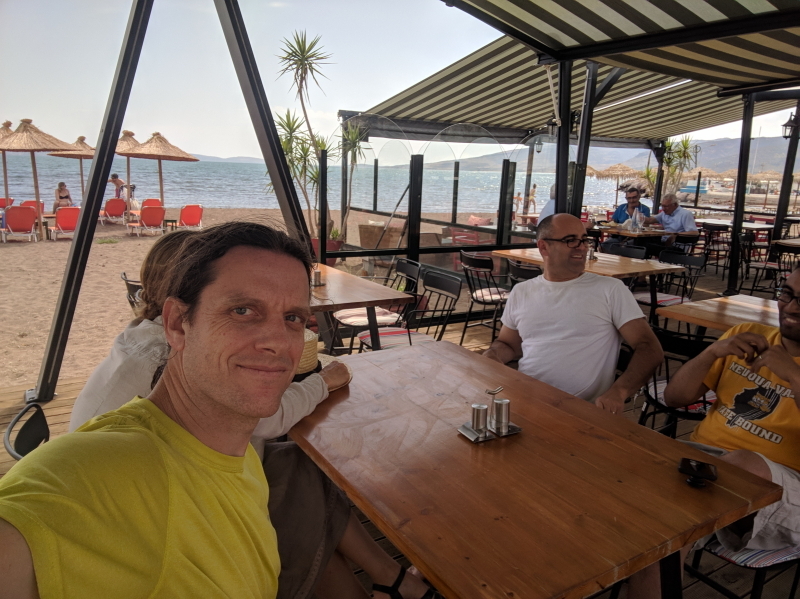 I biked to Skala with a few other people, walked along the beach, then sat and chatted with one of the subject matter experts I know fairly well. The day I arrived I noticed that there was a hiking loop that could take someone to all the monasteries linked to Limonos. I saw the information on a board right in front of Metochi. This is a close-up of the loop itself. The board indicated the loop was 9 kilometers and suggested it would take hikers about 3 hours. Since my afternoon break was just 3 hours, I figured I’d have to do the hike faster than that – ideally 2 hours, but 2 1/2 would still work. I managed to do the whole thing in 1 hour and 46 minutes (skipping a few extensions of the hike along the way). My route was 5.52 miles (or 8.88 kilometres), which is pretty much the route they laid out. The hike is pretty good. There is some elevation gain (533 feet) and there are parts that are really beautiful. 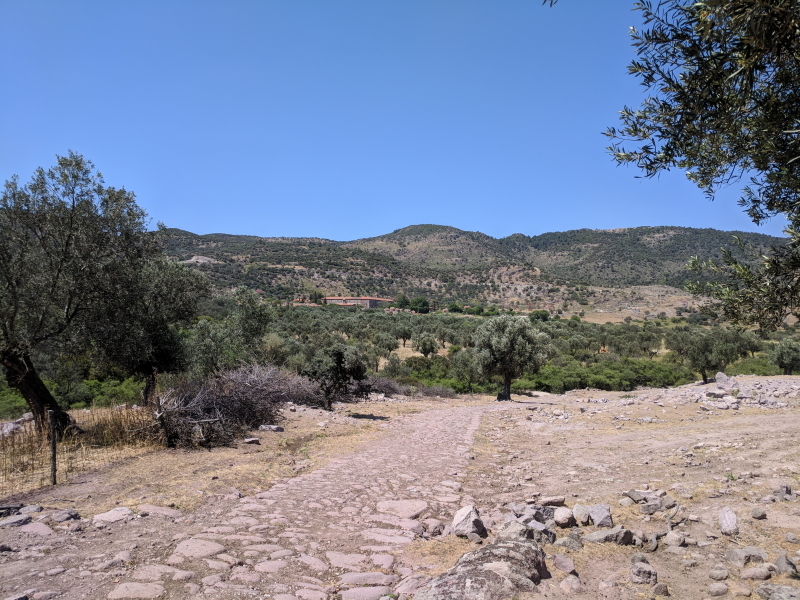 The route from Metochi to Moni Panagias Mirsiniotissis through Dafia is actually not that great. It’s really just a hike on dirt roads and then through a town. However, the route from Moni Panagias Mirsiniotissis to Limonos in particular and then to Metochi is quite lovely. 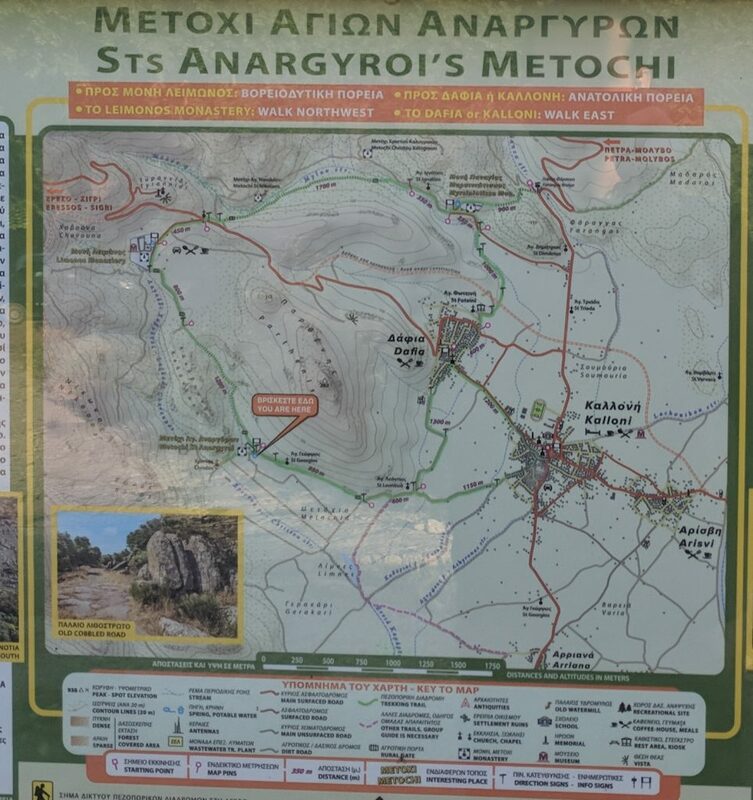 I’d recommend just hiking from Metochi to Moni Panagias Mirsiniotissis and back. The route is fairly well-marked by these red diamonds. There were a few spots where the distance between the diamonds was pretty far and I wasn’t sure I was going the right way but I managed to stay on course for the most part. 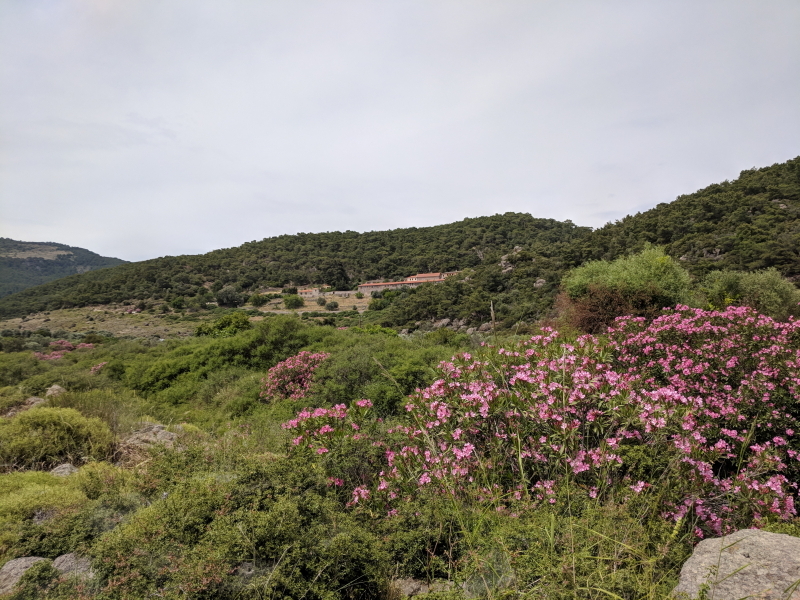 I’d recommend hiking down to this point if you only do the northern half of the loop as it offers really impressive views of Moni Panagias Mirsiniotissis, but this is as far as I would go. Just past this you’ll be walking past the garbage dump of Dafia which is much less impressive. Most of the route from Limonos to Mirsiniotissis is actually a beautiful rock trail like this. It’s gorgeous! This is a shot looking at Skala bay from above Metochi (after leaving Limonos). You’re just leaving the olive groves at this point. I was moving pretty fast as I had to get back to my seminar. Petra is a cute little town with small, winding streets and nice places to shop. After Petra, we went to the Lifejacket Graveyard (informal name) where thousands of life jackets from refugees have been dumped on the island of Lesvos. The original aim of putting them there was to keep them out of sight. However, as the life jackets piled up, they became an impromptu monument to the thousands of refugees – both those who survived and those who did not. It’s a very somber experience to visit. 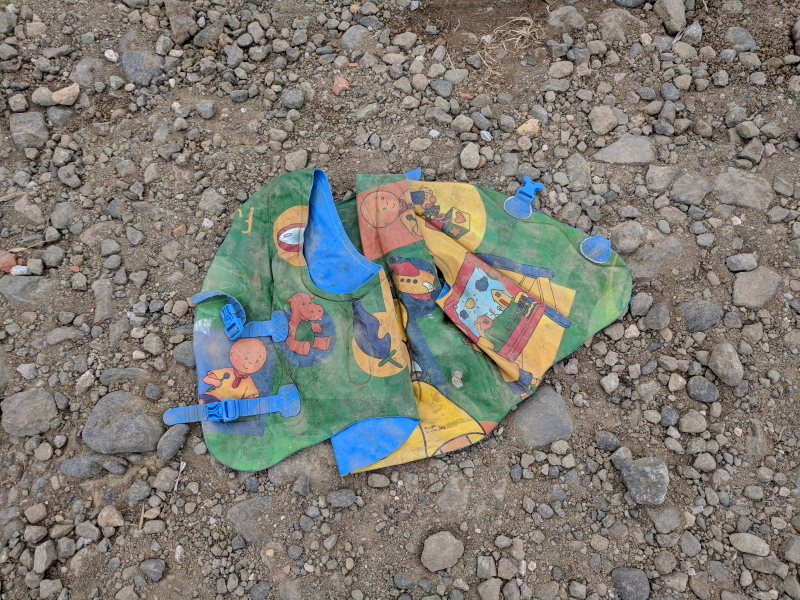 One of the many kids life jackets at the Lifejacket Graveyard. From there, we walked down into Molyvos. 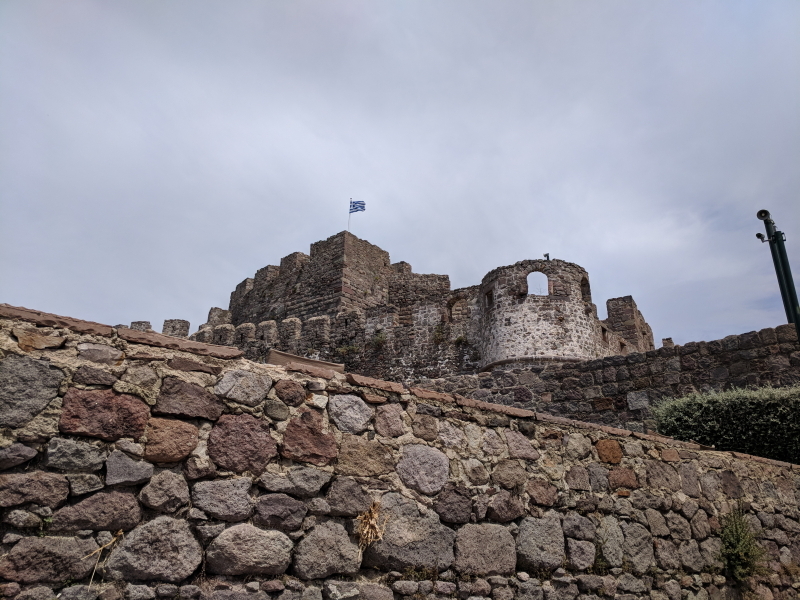 I ran into one of the subject matter experts after leaving the castle and he and I wandered through Molyvos before finding a bar on the beach and ordering a few drinks. We chatted for a couple of hours before heading up to the restaurant where we had dinner reservations. The restaurant had a stunning view and the food was amazing! 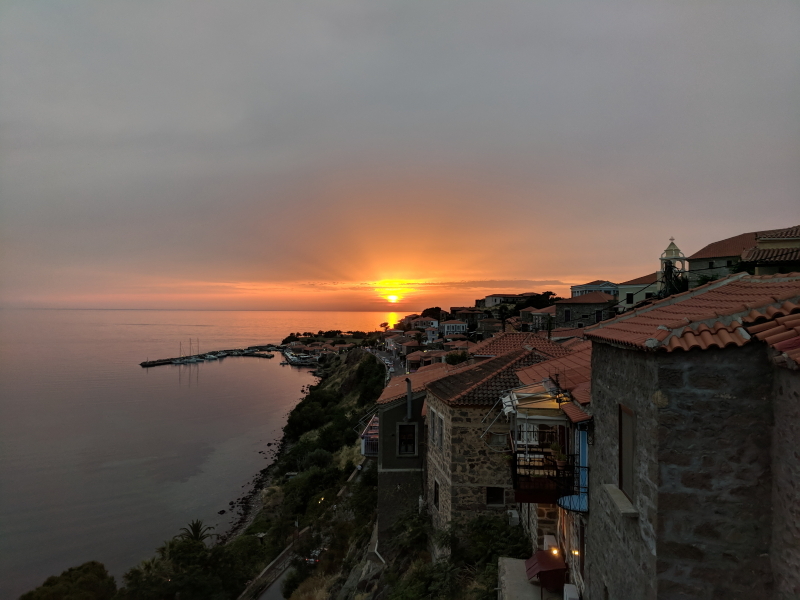 The sunset from our restaurant in Molyvos. Metochi is surrounded by hills that are covered with large boulders. Seeing those large boulders and hills day after day but not finding any hiking trails to climb the hills, I finally decided that I was going to go off-trail and see if I could climb one of the hills. That was a terrible idea. 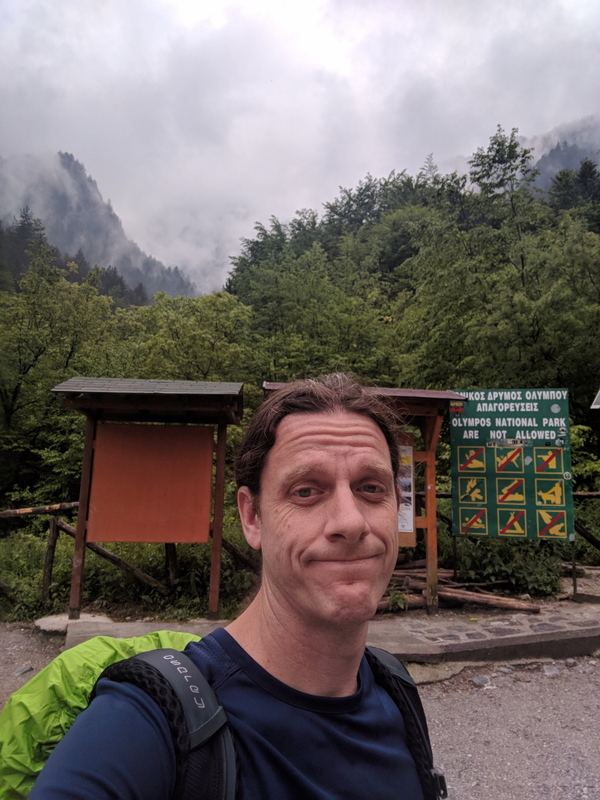 Despite donning some of my hiking pants, my gloves I brought for hiking Mount Olympus, and all my other gear, I still had exposed arms and my neck and face were exposed. The hike started with me wading through thick underbrush. Two minutes in and I was covered with burrs, had encountered multiple thistles, and I had lost a fight with a stinging nettle bush. Ten minutes later, my arms were covered with red bumps where one of the plants I had encountered had started an allergic reaction. I made it halfway up the hill, fighting my way through thorns, thickets, spider webs, and a variety of other plants, each of which really wanted to cause me serious pain. By 20 minutes in, I gave up. I’m not one for quitting, but it was the smart choice this time. I still had to work my way off the hill and down to a trail, which meant wading through some more vicious plants (seriously, everything had thorns). A scant 45 minutes after I started, I returned to Metochi covered in burrs with dozens of bumps on my arms. Hiking off trail in Lesvos is a bad idea. 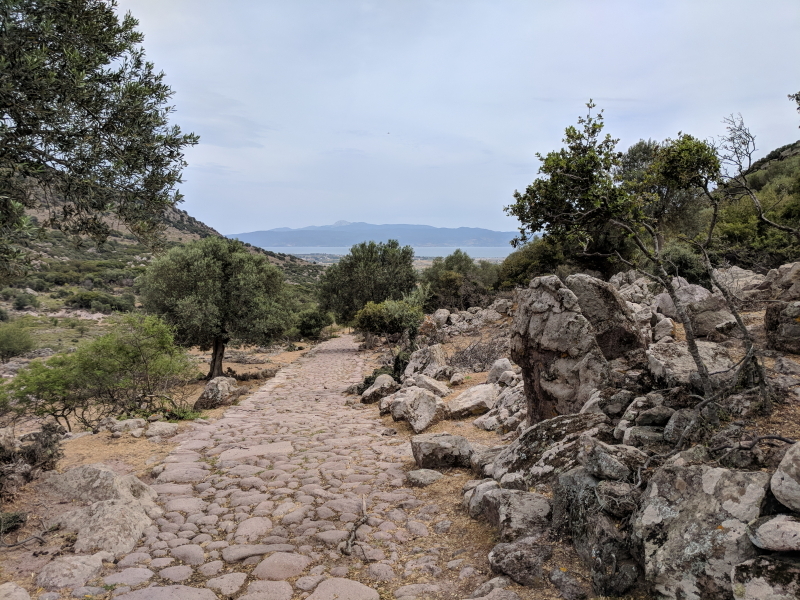 On the last day in Metochi, I hopped back on my bike and rode with a few other individuals down to Skala again. This time, I wore my bathing suit and spent a good hour and a half wading and swimming in the bay with another subject matter expert as we discussed various research projects. We got some lemonade at a cafe on the beach afterward, then rode our bikes back to Metochi. Waiting for our drinks at a beach bar in Skala Kalloni. The rest of the facilities at Metochi were also good. We used a couple of other rooms for our workshops and seminars. There was a large seminar room that could accommodate 40 or 50 people with two projectors and screens. The room I spent the most time in was just off that room and could hold about 8 people. It had a TV for projecting someone’s computer. There were other rooms for meetings but I never went into those. The food was pretty good. All the food was served in the dining area, which was very unique. It was like a cave with a curved ceiling and walls. We ate in there the first night but the rest of the meals we got our food there but ate outside on the picnic tables. We had the same salad for lunch and dinner every day (cucumbers, tomatoes, red onion, and some oil and herbs) and breakfast was typically the same as well, but the main dishes were varied for lunch and dinner. I enjoyed the food. The one thing I didn’t love was the bugs. Obviously, being in the middle of nowhere, you’re going to be closer to nature. But I have never seen so many moths in my life. Every bathroom had like 10 moths in it at any one time. I’m sure I inadvertently killed dozens of them just by showering, closing doors, etc. They were everywhere. There were also lots of flies whenever we would eat outside. Every meal I spent a good amount of time swatting flies off my food. A fly every now and then would have been fine – that’s life. But this was a lot more than that. There were other critters, but the moths and the flies were the annoying ones. Ending on more positive notes… I took a black light a colleague lent me and went out scorpion hunting a couple of nights. In the rocks right outside the front of Metochi I found a scorpion both nights I looked. Scorpions are there, they just hide well during the day. I also found an injured one right in front of some of the rooms (someone must have stepped on it unknowingly as it tried to climb into someone’s room after the sun had gone down). In short, there are scorpions. Check your shoes before you put them on. I loved how there were chairs and tables all over the place at Metochi. I learned a really valuable lesson going there. Being isolated like that – with no TVs or other distractions – made for a lot of time to contemplate. I think I now understand why they called it the “contemplative life” for monks and nuns. Removing all the regular distractions (we still had internet, but we were encouraged to just get together and chat) gave us a lot of time to think. Of course, thinking too much can be a little scary at times. But I found the experience beneficial. In my busy day-to-day life, finding time to just sit and think is rare. I should do that more often. 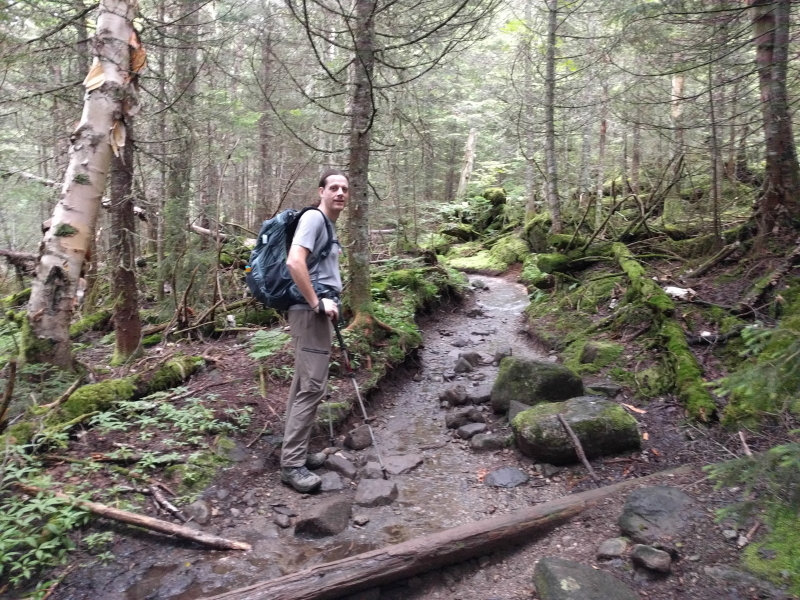 In my big swing across the US that allowed me to complete most of the highpoints in the Northeast in 2013, I didn’t manage to fit in Mount Marcy. It’s a solid day hike, and I just didn’t have the time. 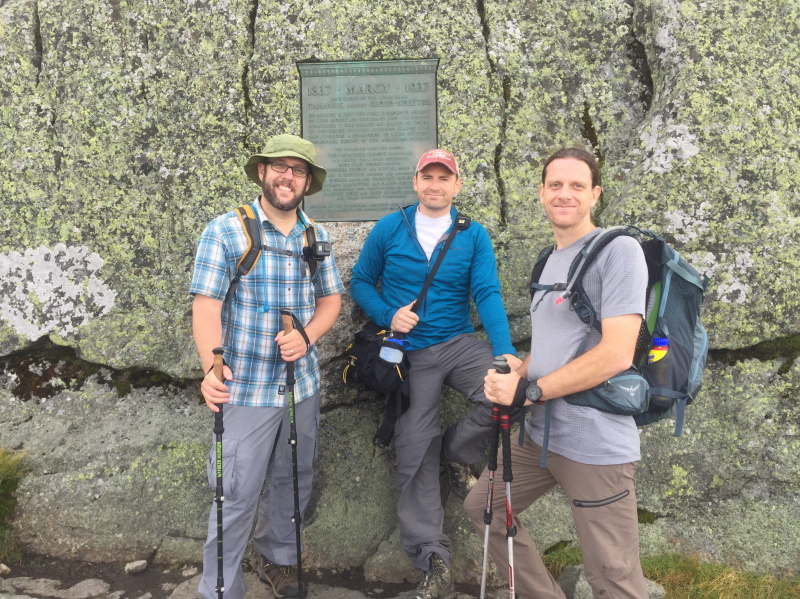 I ended up arranging a trip to Lake Placid, NY specifically to hike Mount Marcy, with my two hiking buddies. We all flew into Newark on Friday, August 11th, picked up a rental car, then headed to Lake Placid, stopping in Albany for dinner and food to take up on our hike the next day. We arrived kind of late (close to 11:00 pm) and planned an early start the next morning (on the mountain at 7:00) in order to hopefully avoid the impending rain storm that was forecast for the next day. The trip reports we read about the hike varied quite a bit. Some suggested it was really challenging, with a lot of uphill and rugged terrain. Others suggested it wasn’t that challenging and was a pleasant hike. We also got variable times and distances for the hike. Some trip reports suggested it would take as short as 4 hours while others suggested as many as 15 (that’s a pretty big range). 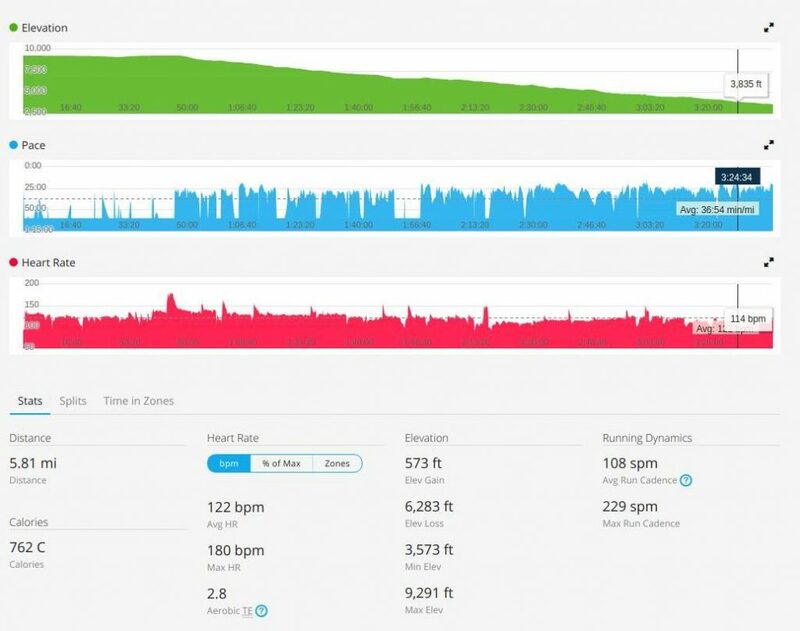 Mileage estimates were also varied, though with a smaller range, hovering between 12 and 17 miles. Because of all the varied estimates, we planned for a 10 to 12 hour, 17-mile hike, just to be safe. As it turns out, using my GPS enabled watch, I now have much more accurate information on the hike. We stayed at a B&B in Lake Placid, got up at 6:00 am, and drove straight to the Adirondack Loj. There is a parking fee there ($5.00), and by the time we arrived just before 7:00 am, the lot was getting pretty full. This is obviously a popular destination for hikers. We got our boots and gear on, did some stretching (a requirement once you hit 40), signed the register, and hit the trail. We made good time for the first three miles or so, covering them in about an hour. 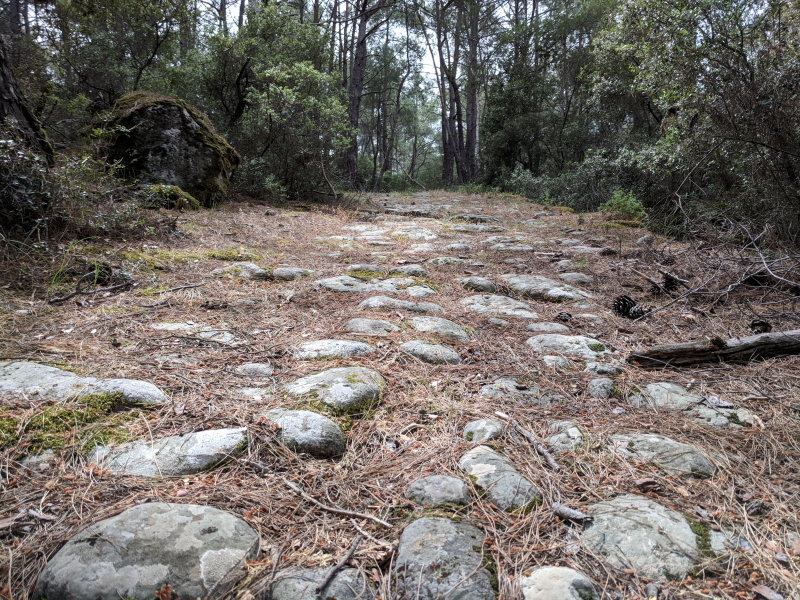 The first three miles of the trail are fairly level and it is mostly a well-maintained dirt trail, with a few roots, rocks, and other small objects in the way. But around the 3-mile mark, there was a noticeable shift in the trail and terrain. Not only was there substantially more uphill terrain, but it became rocky to the point that at times you are literally boulder hopping. Me on a nice patch of the more rugged terrain. I’ve climbed a lot of mountains and was impressed with how rugged this trail got. 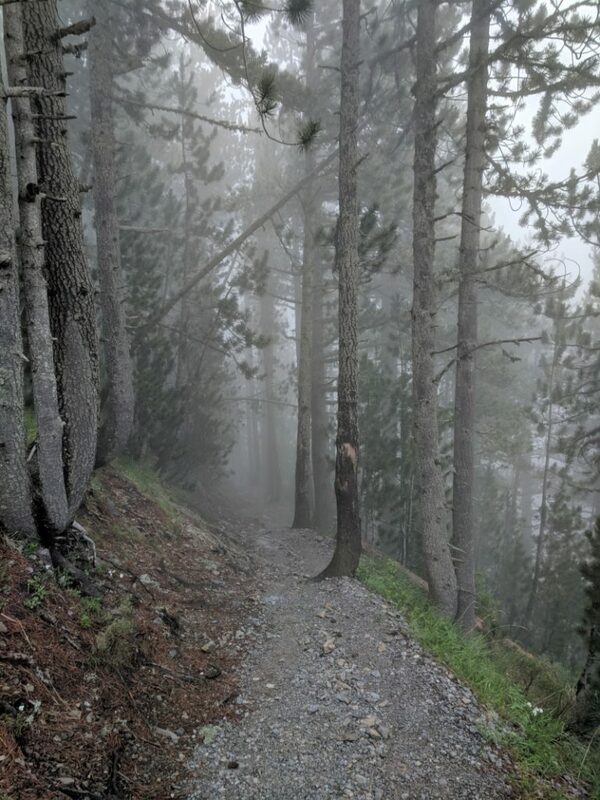 This is not a trail you’d want to attempt in light tennis shoes (unless you’re an experienced trail runner); sturdy boots are a very good idea for this hike, ideally with good ankle support. We didn’t make as good of time on the remaining 4 miles to the summit but still did fairly well. We arrived at the summit at just under 4 hours. When we arrived, the summit was completely enshrouded with clouds. We had no view whatsoever. We spent about 40 minutes on the summit, eating a little food and chatting with the forest ranger on the top who was reminding people to avoid the vegetation, which they are trying to get to grow back. The three of us at the summit marker just below the actual summit. We got better photos at this point, but we were still worried about the impending rain storm. The top of the mountain is largely exposed rock that wouldn’t be all that fun to ascend or descend in the rain. As a result, we opted not to return to the summit and instead to continue our descent. We stopped a few times on the way down to take advantage of some of the toilets that are along the trail and took a quick detour to the waterfall that is also fairly close to the trail. With our detours and stops, we returned to the parking lot in just under 8 hours. The distance on my watch indicated exactly 15 miles. So, there you have it – it is a 15-mile hike. Our average moving pace was 26 minutes per mile. If you know how quickly you can move on fairly rugged terrain, you should be able to estimate how long the hike will take you. We were passed by a couple who were clearly trail runners. They were the only ones moving more quickly than we were and they probably did the entire hike in 6 1/2 hours. I can see how this hike would easily take 12 hours if you’re not an avid hiker and in good shape. It is genuinely rugged terrain, particularly after the 3-mile mark, and you should be prepared for it. Obviously, if you can, try to go on a nice day. The views from the top are supposed to be quite nice. But even hiking in cloudy conditions, the terrain was pretty. We passed through multiple types of forest – pine and maple – and really enjoyed ourselves.